What makes your product a great solution? Why should somebody take the time to check it out? An elevator pitch answers this question in seconds. To cover all the important parts, Geoffrey Moore presented a template for elevator pitches in “Crossing the Chasm”. This week’s 1-pager is a variation of his template. Word of caution: Don’t make this the actual pitch! Use this template to explicitly think about your product. Fill in the blanks to base trade offs on and to inform a real – more interesting, less formulaic – elevator product pitch. You don’t have a product? Why not create a pitch for yourself, for your next job interview? * Don’t make this the actual pitch! 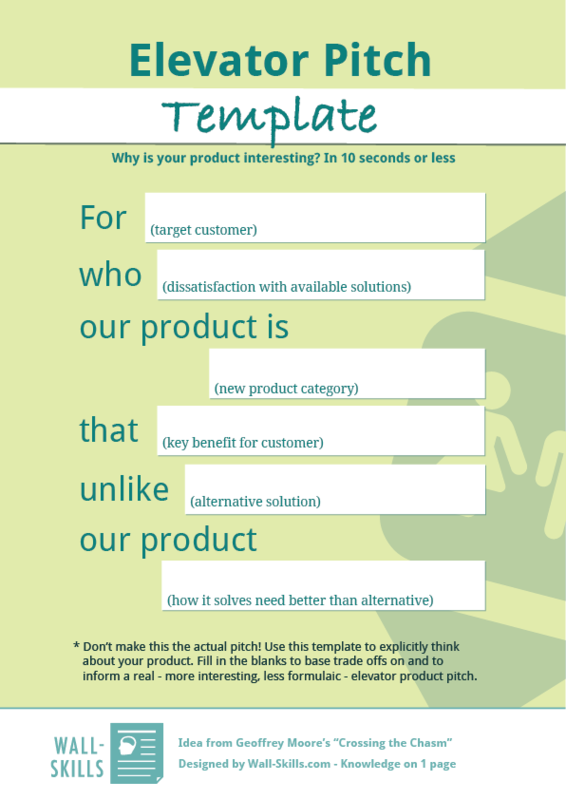 Use this template to explicitly think about your product. Fill in the blanks to base trade offs on and to inform a real – more interesting, less formulaic – elevator product pitch.